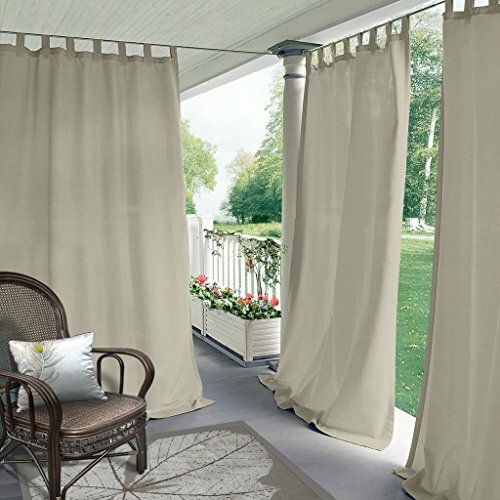 Blackout Outdoor Curtain Tab Top Beige 84" W x 120" L For Front Porch, Pergola, Cabana, Covered Patio, Gazebo, Dock, and Beach Home (1 Panel). Fit for: Outdoor,room dividers, indoor. Feature: Innovative triple-weave construction helps block out light, outside noise and insulates against heat and cold cutting back on window related energy loss. Create an idyllic outdoor space and convert your balcony, patio or garden area into an outdoor room through the use of curtains. In more exposed spaces, source durable, weatherproof fabric which will offer shade and protection. Outdoor curtains work best in warmer climates, offering shade and bug protection. These fabrics often don't need extra lining, since they're specifically constructed for these purposes. They defy mildew, moisture and fading. They waft light insects away, give privacy and a lovely summery air. Diaphanous drapes allow filtered sunlight in to create an intimate outdoor living space. They can be taken down for winter storage.If you do add a roof, circle it with curtains. You can easily block a breeze when it becomes too chilly, plus, aesthetically, their addition will give your covered patio a tropical cabana feel. Click contact ChadMade and advise us following information for pricing inquiry. 2) Single Panel Width: __inch. Normally curtain width need to be 1.25X-2X wider than rod or track width for fullness. 3) Single Panel Length: __inch. Please place order for special pricing adjuster listing (ASIN B01LZT2DQ6), and advise us with order ID to execute it exactly. To know more information for custom made order, please click "ChadMade" and review seller profile, then click "Help" section. Same color front and back. Light Control, UV RAY Protection, Thermal Insulation, Mildew Resistant, Fade Resistance. Curtains without liner impede 85%-99% light and UV ray. Perfect for front porch, pergola, cabana, covered patio, gazebo, dock, beach home. Tab height 4". 6 tabs per 40" width. Side hem 1", bottom hem 3 1/8". Tips: Thread trimed and wrinkle free, all set for you to put them up right away. Matching tiebacks included for promotion periodically. View More In Outdoor Curtains. If you have any questions about this product by ChadMade, contact us by completing and submitting the form below. If you are looking for a specif part number, please include it with your message. Outdoor Decor Escape Stripe Grommet Top Curtain Panel-Green, 54 x 96"
© 2019 - tpmhome.com. All Rights Reserved.